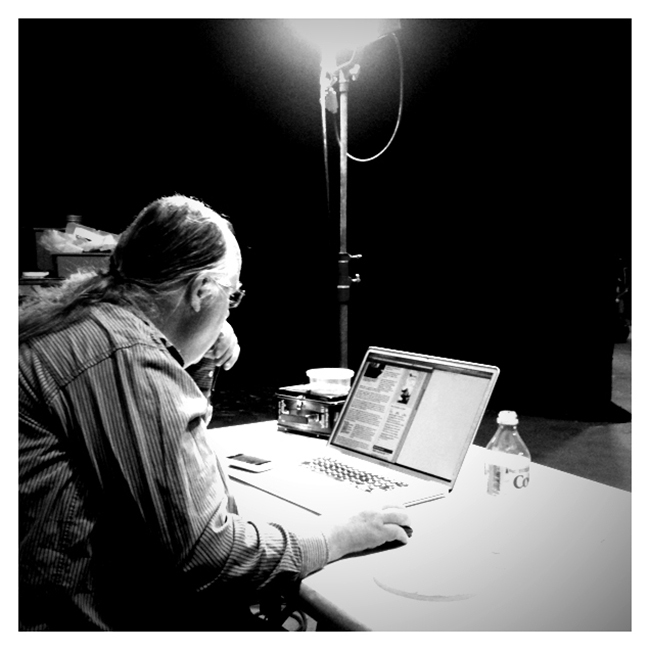 Tom Duff programming on a sound stage at Kerner Boulevard in San Rafael. Photo: Mark VandeWettering; courtesy Tom Duff. Tim Perkis: How did you get involved in the music scene here? I know you have volunteered a lot in different organizations. Tom Duff: It started when my son Timmy was about ten, so that’ll be 1998, a couple years after we moved to the Bay Area. I figured out that it was okay to go out for an evening now. [Laughter] I started going to Beanbender’s concerts as that series was reaching its final peak, until about 2000. They had all kinds of great stuff. Every Sunday. I don’t know how they did it. TP: Yeah. It was a good moment. How did you go from being an audience member to running a series? TD: When the Beanbender’s series came to an end, a small group (Matt Ingalls, Matthew Sperry, Eli Crews, John Shiurba, Kattt Atchley, Alan Brightbill, and eventually me) started up a series called Acme Observatory, that put on about eighty concerts over a period of five years, ending when the storefront we were using was condemned. That’s where I really learned, mostly from Matt Ingalls, how to put on a series. A while after Acme Observatory finished, Gino Robair, John Shiurba, and Liz Albee started doing a monthly series at the Temescal Art Center and they asked me if I’d like to be involved. After about six months we had a disagreement with that organization and I suggested that we move the series to my house — we have enough space in the living room for the typical audience we get, and we have a really nice piano, which most storefront venues don’t. I like doing concerts at home — there’s no landlord to negotiate with, and after a tiring concert we can just go to bed and put the chairs away in the morning. 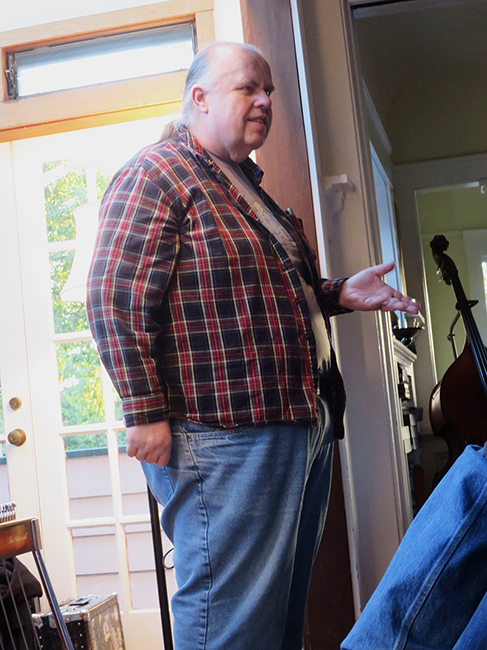 TP: And when did your interest in experimental music begin? TD: I’d always had an interest in new and adventurous music since I was a kid in the 1960s. Probably the biggest thing that pushed that was my dad — he was an amateur musician at a high level. He was a tenor soloist at our church in Toronto where I grew up. He had a group of friends that would come over once a week to sing madrigals, and he just had his ear to the wall. One summer, 1967 or ’68, he came home from a day at the Royal Conservatory of Music with a pile of tickets in his hand for a festival of new music that the Canadian Broadcasting Corporation Toronto put on every summer, mostly with the aim of capturing recordings for broadcast throughout the year. And this series had all kinds of great things on it. I heard a premiere of a Boulez piece for a large ensemble that involved a lot of guys jumping up and giving hand signals and stuff. TP: How old were you then? TD: I would have been fourteen or fifteen. TP: Had you already listened to any Stockhausen records, that kind of thing? TD: You know, it’s hard to say what came first. But yeah, I had a pile of records from those Deutsche Grammophon avant-garde box sets. I would save my nickels for months. TP: They had them at the local library where I was. TD: I had a recording of Berio’s Visage, his collaboration with Cathy Berberian. And I wore the grooves smooth in that. I also remember an open house at the University of Toronto Electronic Music Studio run by Gustav Ciamaga. It had a whole lot of instruments that Hugh Le Caine had designed and built. He worked at the National Research Council in Ottawa, but he had a relationship with several music departments at universities in Canada and Israel and designed and built equipment for them. He built this thing called the serial sequence generator that was basically a twelve-step sequencer. He also made a tape loop player that had multiple heads so you could put half a dozen loops of tape on it and a little keyboard to control the speed of their playback. TP: Were you doing computer stuff already at that time? TD: It was definitely new music first. I started doing computer stuff in 1969, the year before I graduated from high school. TP: You got access to some kind of computer situation around then? TD: Yes, yes. One of the computer programmers at the Toronto Board of Education Office where the Board’s computer (their one computer) was decided he wanted to teach kids to program on Saturdays. My mom, who was a high school teacher, heard about this, and said “you should do this.” And I remember the first program I wrote for that class worked the first time. I think I have the paper listing somewhere. I should find it. I should frame it. I’m convinced, had that come out differently, if I’d not had that complete and early encouragement — “Oh, this is easy!” right? — I’d probably be playing guitar in a bar now or something. TD: And then summers I spent at the Royal Conservatory of Music. They had a composition class that I took in 1967 and I’d got the bug for that. TP: Oh, so were you composing? Were you performing or singing? TD: I was composing and playing the flute. And then for two summers, 1968 and ’69, I took a summer course at the Conservatory’s Electronic Music Studio, which was just like two rooms down in a basement. Two studios set up with identical equipment, a couple of Revox tape recorders, a couple of home-built variable speed tape loop players, a dozen oscillators; random bits of equipment. I spent my summers splicing bits of tape together. I have those tapes somewhere. TP: So they were letting you in there as a high school kid? Awesome. TD: Yeah. Another student was a woman named Violet Archer, who was probably in her late fifties at the time. You know, when you’re sixteen you can’t tell how old people are. Turns out she was one of Canada’s foremost composers. Like, nationally famous; she died years ago but had all kinds of medals, national honors, stuff like that. And she was trying to figure out electronic music. She mostly wrote chamber music. There was another kid who was a couple years older than me named John Chong who’s a well-known music educator and composer in Canada now. I worked on a couple of pieces with an American student named David Baker, who later became an important jazz engineer and producer. TD: Yeah, as soon as I took up computer programming I started writing programs that would generate sequences I could transcribe into music notation. I didn’t actually know what I was doing. I still don’t know what I’m doing, but that’s okay. Definitely the idea of music as a participation sport, something that people actually do, was really in the air. My mom was a pretty good amateur piano player. And she always said that my dad never made music a profession because he had muscular dystrophy, which meant an opera career was pretty much out of the question for him — he would have trouble getting around on stage. His dad, who died before I was born, was a professional musician. He was blind and, as many blind people do, developed a really good ear early on. Somewhere I have his flyer, a picture that features him as Canada’s foremost blind organist. The Canadian Guild of Organists is affiliated with the American Guild of Organists, which developed the certification program sometime when he was young; he was the first person they ever certified. 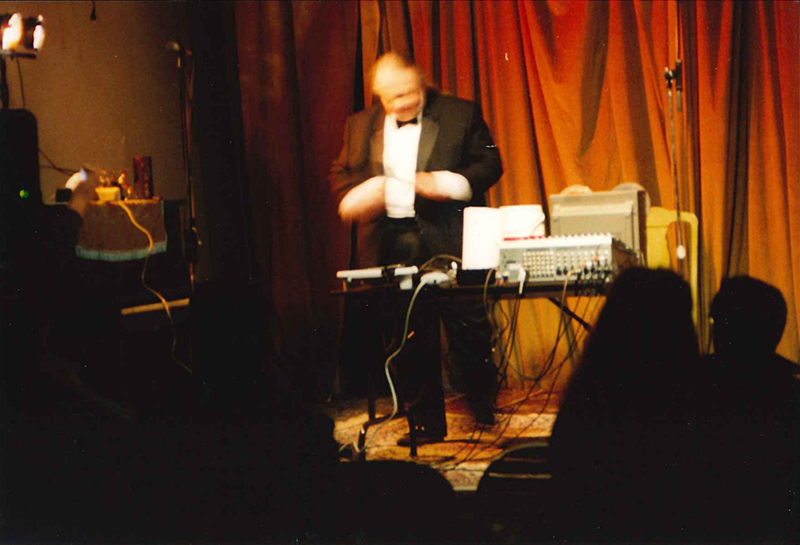 Tom Duff performing at the Acme Observatory series, December 7, 2002. Photo courtesy Matt Ingalls. TP: I guess he toured churches, huh? TD: Yeah, churches and community music halls and whatnot. He was working mostly in the 1920s, when there were a lot of musicians making a good middle-class living touring the immediate area where they lived, because that’s how you heard music. With the rise of recordings and radio especially in the late 1920s those opportunities pretty much evaporated. Everybody could listen to the best pianist in the world on the radio. TP: The guy down at the bottom didn’t sound that great after that. It’s too bad. TD: I’m sorry that participatory music activities, except at places like our house, are pretty much dead now. TP: That’s where it lives, in the niches, the little scenes; there’s no audience, in a certain way, beyond the participants. TD: When we have a concert here I get up and do some announcements and there’s always a back and forth with the audience and it’s usually, “Oh yeah, you’re playing next week,” or somebody in the audience telling me about what they’re doing or their personal connection to the performer’s world. There are very few people that are pure audience for this stuff. There’s me, and a couple of my friends who come all the time just because they’re friends. TP: Yeah I’ve met some of those people. Susan Dickey [Tom’s wife]: There’s me. TD: There’s Susan, yes. There’s Martin and Virginia Davis, who we know because Martin was one of Susan’s university professors when she was in graduate school at NYU, and they moved out here to California about the same time we did. Martin is one of the world’s foremost mathematicians. David Hilbert, this famous mathematician from the early twentieth century, gave this talk where he listed something like twenty-four problems that he thought, “would drive mathematics for the next hundred years,” and he was pretty much right. Martin is the person who found the solution to Hilbert’s tenth problem, Martin and a few other people. And he’s well-known in computer science as well. The Davis–Putnam algorithm for minimizing Boolean circuits is his. Apparently he gets invited to computer-aided design conferences all the time, and is like, “I did this work in the 1950s and I haven’t thought about the problem at all since then, but thank you. They keep wanting to give me little medals.” It’s really nice having smart friends. You know that’s part of what I get out of putting on concerts; most of the people who do this stuff, they’re pretty bright and they’re pretty interesting. TP: It’s true. Improv players tend to be intelligent, really curious, and have broad interests. So you also got some kind of medal a couple years ago, back in Toronto right? TD: Actually from Waterloo, which is my undergraduate school. It’s the J.W. Graham Medal in Computing or something. The award gets kicked out every year to some alumnus who’s done things they think are important. And I’ve done a certain amount of research on computer graphics that’s turned out to be important. I mean, you know, I was in this business when nobody wanted to be in the business, nobody with any sense was thinking about this stuff at all. In the 1970s, computers making pictures? It was a pipe dream mostly. But somebody has to figure out what the foundation looks like. I got to work on that stuff. And now if you turn your television on pretty much every pixel you see on the screen has had computation done on it that I figured out how to do. It’s absolutely ubiquitous. My position on that is that I was the lucky guy. TP: Maybe, but it was you who figured it out. There were a lot of other engineers around at the time who didn’t figure that stuff out. So are these awards all about compositing and sharpening images and so on? TD: One of those two Academy Awards is for that as well. And the other one is for designing the first version of Pixar’s animation system back in 1983. TP: Was that at Lucasfilm? TD: That’s right. Pixar split off from Lucasfilm in 1986. 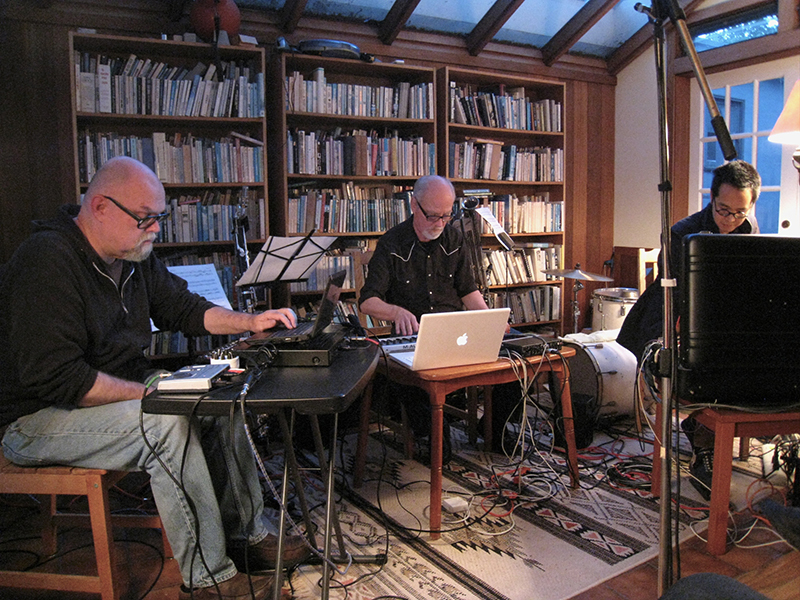 Tim Perkis, John Bischoff, and James Fei performing at Tom’s Place, May 10, 2011. Photo: Michael Zelner. TP: Like computer graphics, music was also very impractical to do with computers at that time. How do you think of the relation between what ended up being your professional work and your ongoing musical interests? TP: There weren’t dozens of those in every home, as there are now! TD: There weren’t a lot of those around. I wrote the direct device drivers and a little bit of software to run them, nothing really serious. But a lot of the same knowledge is useful in both fields. I mean they’re both basically signal processing domains down at the bottom: understanding how signals are processed, how convolution works, how to deal with aliases is actually probably more important in computer graphics than in computer music. In computer music, my impression is people mostly just blast through all of that stuff and if they’re having trouble they double the sample rate. There are good systematic ways of dealing with that stuff that would be useful in computer music, but as far as I know it’s basically not used. TP: So in general computer music has been unlucky that you went the other way [laughter], and there are still things to be discovered there if you had been focused on that direction. But there’s another aspect of your work that’s interesting to me: maybe this sounds too far-fetched to you, but it seems like this professional path you’ve taken, which supports animation artists in these non-obvious but profound ways, relates to the ways in which you support musicians — through your series, for example. You’re really supporting the arts in a very material way by creating understanding, by building the foundations that whole genres of art have been based on. How much has taking that social role just been accidental, or how much have you consciously sought work that has that character of supporting artists indirectly? TD: I’m definitely not an artist. I might be a musician. I’m pretty shy about it. But I get to do art anyway because I’ve mastered a technical craft that’s useful to artists. TP: That’s a very definite statement. How do you see the relation between science, craft, art, and this kind of technology development? These things all have certain differences and overlaps. TD: Technology and art working together have a long history. I mean Leonardo da Vinci, for example, worked hard on getting pigments in plaster to do frescos. You know, that stuff is extremely technical art and a lot of engineering development goes into making it work. And historically, you’ll often find that it’s the same person doing both; Leonardo’s absolutely the best example of that. This is a guy who had an engineering mindset, and also had the talent and skills of an artist and they worked together. I think it’s only kind of recently in the twentieth century that those two fields have drawn apart. TP: Perhaps romanticism is to blame: the idea that somehow art is all about a sort of emotional effusion, somehow contrary to the rationality that an engineer must employ. TD: But in fact artists in school learn all of this technical stuff. They learn about color mixing, color theory. Sculptors learn all kinds of mechanical engineering stuff. They all treat it really intuitively for the most part. I think the difference is that most of the media that most artists work in are sufficiently mature that you don’t have to understand in detail the underlying technology. It’s like driving a car. You don’t need to know how a four-stroke motor works to drive a car. But at some point you did. TP: There has been a sort of skin put on it for you, yeah. TD: I think it’s really odd that a lot of artists don’t want to know how stuff works. An awful lot of engineering work goes into making the tools work like the tools they used before there was a computer in the building. TP: They just look at it like paper, a simple, given aspect of their work environment that they don’t have to think about. TD: I have to say not everyone is like that. There are plenty of guys at Pixar who have great computer chops and do good things. If you look at the Pixar film The Good Dinosaur and look at the landscapes and the dynamics, there’s a river in it that’s important to the story, the dynamics of that. Guys who don’t understand how the computer works can’t do that stuff. TP: So it’s being made by people who are doing that whole process, the aesthetic of it as well as making it work technically. TD: The character animators, on the other hand, usually have someone with technical skills working with them. And I guess I understand that because the skill of character animation is so rare and so difficult that asking them to develop the sort of technical skill required to make it work on a computer is really asking a lot. TD: Yes. I’m well known in some circles for this thing. TP: It seems you were able to come up with this because you knew the “real grammar” of C that is implemented in the compiler, rather than the “folk grammar” that most programmers think defines what is legal or not in the C language. TD: Yes, on some level I knew what the real grammar was. It’s an interesting story how that came about. In 1975 I first saw the C compiler that Dennis Ritchie, who designed the C language, had written. That was the compiler I used to learn the language — this is when I was in graduate school. The compiler was really compact as such things go, maybe 10,000 lines. And if you were a graduate student that had no other obligations taking your time you could sit down and read through the thing and find out how it worked. And that’s how I discovered what the real grammar of the language was. So I knew that you could legally write that particular bit of code where other people wouldn’t. And I had enough experience writing assembly code to know that this is a way that you speed loops up. TD: So you had to know not only that it was possible but that it was valuable here and you wouldn’t know either of those things if you had just superficial knowledge of the language or even a perfectly adequate knowledge to program in that language. TD: I’m working on a talk about the things I learned from Dennis. I worked in the same lab as him for ten years, twelve years, at Bell Labs. I’m normally a quiet kind of guy and so was he, and we didn’t talk a lot, but every minute with him you were learning stuff. I miss him. TP: Well, this is just the nature of our thought processes: we have models of what is happening necessarily to reduce the complexity of the world to a manageable size and we forget that they’re actually inadequate. We need reminders of this — I would say that’s a large part of what art is for! And in the computer world there are many layers of abstraction that are necessary and useful; as you were saying about your character animators at Pixar, they don’t need to know about code and pointers and other technicalities. But there are times when you have to know what’s underneath. Tom Duff hosting Tom’s Place, ca. 2017. Photo: Michael Zelner. TD: What’s underneath drives your surface experience, in a sort of atomic physics kind of way, in the sense that you have no direct experience of elementary particles for the most part. Your experiences of these things operating in ensembles of zillions of — I don’t have a word for how big that number is. Nevertheless all of that stuff is driven from the very, very basic level; particle physics is, on some level, very simple. It’s only that it ramifies so much between the particle level and the human experience level that makes it complicated. I mean, Richard Feynman spoke on quantum electrodynamics in this little thin book, it’s about fifty pages. He explains the whole theory. And it’s pretty clear by the time you get to the end of the book that, well, you can’t do anything with that. That’s maybe a complete description of electrodynamics but at the single particle level. But you know even at that level you’re talking about effects that happen by averaging over infinite numbers of paths and stuff like that; there’s heavyweight mathematics involved in turning that into something real. And of course that’s what physics students spend graduate school doing: figuring out how to take this theory that’s actually very simple and turning it into something that works on huge ensembles of particles. In anticipation of you showing up. I was thinking about something related to this this morning: What it is that computers do for us in this sort of activity? And the answer you might have — that’s the thing about art, everybody’s got their own answer, right? — is an economy of action. You get to a point where the work that you do compared to the work that gets done is really tiny, and in fact that’s kind of a principle of life, generally. I once hired a guy to rebuild the foundation for my house. It was pretty easy. All I had to do was phone him up and write a check. It’s the same with getting computers to make sound for you. I write a few thousand lines of code and billions of samples come out, trillions of CPU cycles spent on them, doing basically the same work over and over again because I specified it in 10,000 lines. TP: It’s not really that complex. TD: It’s really in the ramification that that stuff comes up. And you know The Hub works like that. My view of The Hub is that there are things that are all connected, and there’s an economy of action right? You and the other guys in the band spend, you know, could be a few minutes, could be a few hours, could be a few days, putting together programs for your individual computers according to some more or less vague specification, and you set ’em loose. And there’s an economy of action in that and it manifests itself at the point where you set it loose and the system does something. Lots of musical situations are like that. I think free improvisation is sort of like that. You sit down, someone makes a sound and you’re setting a bunch of musicians loose on it. And nobody knows what’s going to happen. TP: Yeah I always think of it like conversation; you don’t even know what you’re going to say because you’re here to respond to what the other person said. You don’t even know what you’re going to do yourself thirty seconds in the future. Except when people have these little canned speeches like I just did about that. TD: Out in the back I have all my musical junk: an electric guitar and a bunch of those little boxes that people plug their guitars into. If you just plug them together in a loop and start fiddling the knobs, interesting things happen. And you have no idea what; there’s not even any sound going yet! Well, pretty much everybody that has a bunch of those stomp boxes knows about this; it’s not artistically very interesting anymore because everybody does it and it kind of sounds the same every time. But the archetype is the idea of a bunch of things that process sound connected in a loop and in some sense they’re all interpreting what the last guy did. This is kind of what The Hub does too. TP: After doing this kind of stuff for years I more and more feel like we wildly underestimate how much of the process is on the perceiver’s side. TP: How much of the pattern creation is just happening in brains. There’s a certain framework of patterning that, as the artist, you do make. But it’s actually just getting to a certain complexity or activation level for people to start hearing it as music and making their own assessment of it. We want to admire artists and we think we’re looking for genius, you know? There are social reasons that it’s always been, “Well it’s all coming out of Beethoven’s brain,” or whatever, but I don’t think that’s the right picture. TD: But no. It’s going into the listener’s brain — in some sense that’s where the art happens. TP: This may sound frivolous, but I somehow relate this to the idea of you guys putting out all these snacks and wine at the concerts: the idea that you’re going to support this activity in a way that’s not one of the things people think about as being a constituent of making the activity work, right? It’s a support function but it’s actually crucial, right? Because the model of what is going on is not exhaustive enough to cover the fact that there are many other things that involve the environment and community: how people feel, how comfortable the audience and players are — these are crucial elements of creation that are outside a narrow model of what the activity is. TP: There’s comfort in a certain level of sameness. It’s ritualistic in a way. Before you were at Lucasfilm, you worked at Bell Labs in New Jersey, right? TD: I moved back and forth from the East Coast to the West Coast a couple of times. I was in graduate school in 1976 or ’77, or something like that, in Toronto. And I had gotten to that point that everybody gets to in graduate school where the only real work left to do is to write a dissertation and you don’t know what you’re going to do. And I was getting no help. The things that I was interested in doing, people in the department thought they were a waste of time. Mostly history has proved them wrong. But the opportunity came up to work at a computer graphics lab on Long Island at a local technical school called the New York Institute of Technology. One of my friends went down there for a visit, and said, “You should go talk to them.” So I did, and they hired me. I spent four years there and that’s where I actually learned to do computer graphics. TP: So was that an academic job? TD: No, no, it was a funny thing. There was no graduate school at this place. The lab was attached to the school but separate, we had no students. It was a privately operated college and the guy that owned the place wanted to be Walt Disney. He had funded a conventional cartoon studio that had made a feature-length cartoon. The worst feature-length animated film ever made. If you get a chance to see it, don’t. TP: So Ed Catmull was the guy who hired you there? TD: Yes. He hired me directly out of college and I’m still working for him forty years later. TP: Come and see us in twenty years. TD: They were very encouraging but not willing to put any money on the line. There’s a book about early times at Pixar that probably describes it. I’m not sure how Ed came to talk to George Lucas about it but I think part of it was that George just had this gigantic success with Star Wars. He completely changed the way the movie industry works; the industry now is the direct logical consequence of Star Wars. George had an important friend who was a serious technology buff: Francis Ford Coppola. Francis had his ear and kept telling him, “You know, you got all this money. You need to spend some of it on fixing the technology that we operate with.” In 1980 movies were still edited on Moviolas, invented in 1920. 1980s vintage Moviolas were made out of the same castings that they were made out of in 1920. Right? And movie sound was edited by synchronizing a whole lot of projectors and putting on optical tracks with one channel of the mix on each of these projectors and mixing them live. Special effects were done with mysterious optical and chemical technology, that we had to learn about. But. Francis talked George into hiring some people, Ed mainly, and started up a bunch of projects under Ed’s direction to do digital film editing, digital audio editing. And then digital optical printing to replace these complicated Rube Goldberg things that took multiple strips of film and projected them all onto another strip of film — to get Luke Skywalker’s face and the model spaceship in the same shot, that sort of thing. TP: Like scanning video screens to film and back? TD: No, oh no. Basically you take a film projector playing a movie and a film camera and point one at the other. And do complicated tricks with that. TP: So it was a very broad mandate to modernize the workflow of moviemaking. TD: And the great thing about it is, that’s how movies are done now. The film editing stuff was eventually sold to Avid Corporation or their predecessor, I forget what they were called, and the editing system that we devised is the early predecessor of Avid which is what everyone uses now. The film audio stuff was eventually spun off and turned into Sonic Solutions. The computer graphics stuff was sort of incidental. The main idea was: well, we’re going to scan these films into the computer, and then we’re going to scan them back out to film and something’s got to happen in between. And that turned into Pixar. 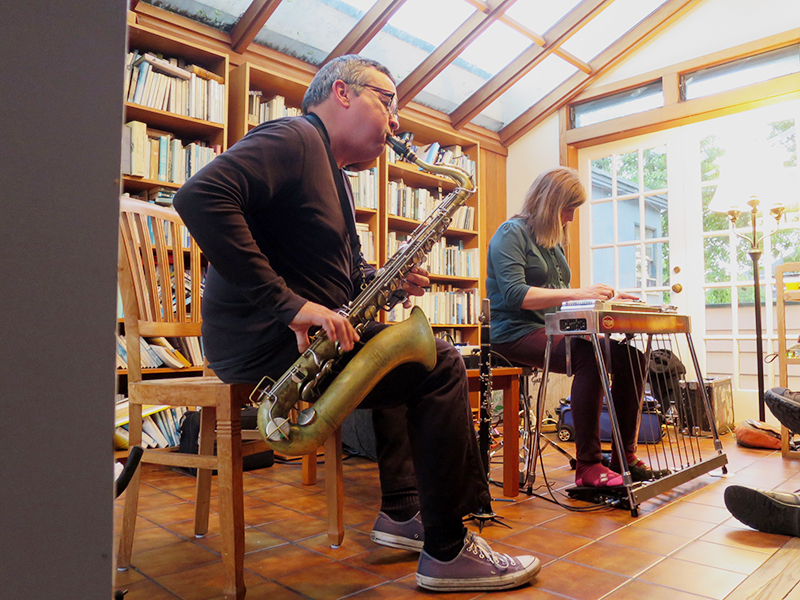 Phillip Greenlief and Susan Alcorn performing at Tom’s Place, April 27, 2017. Photo: Michael Zelner. TP: The key piece of that was having electronic compositing, right? Instead of doing the optical printing. TD: George didn’t know this part, but it turned out that completely synthetic imagery was the killer app for that stuff. There was a time up until about ten years ago when for probably twenty or twenty-five years every nominee — I might be exaggerating a little but not much — every nominee for the special effects Academy Awards was done with Pixar’s image generation software. That hegemony has evaporated because it turns out that computers are fast enough now that just any damn piece of software can do it. TP: It doesn’t have to be super clever anymore. So that’s exciting, I can see how that work would just absorb you. TD: It’s a rollercoaster ride that started in the 1970s in a room with a dozen PDP-11 minicomputers. And we thought we were going to make feature films with that. When we finally got a feature film out, instead of a dozen PDP-11s we had five-hundred Sun 3 workstations. When we finally got a film out, it was Toy Story. So it’s an animated feature, which was the original goal, right? Those Sun 3s were each a thousand times faster than the PDP-11, and had a thousand times as much memory. And there’s a thousand times as many of them, give or take. So it’s a billion times harder than we thought. TP: That must be some record of how wrong one can be and still eventually make things work. So you successfully avoided having an academic career. TD: Yes, well, in graduate school I had a pretty close look at that. TP: Did you just luck out in having these much more attractive possibilities present themselves fairly quickly or did you really make a decision at that point that academia was not where you wanted to be? TD: When I was in graduate school I thought I was going to make a career of research and I don’t think I knew exactly how I was going to do that. The models I had in mind were the industrial research labs of the 1950s and ’60s, in particular Bell Labs; the RCA David Sarnoff Center; oddly enough, the Corning Glass Laboratories in New York — a physics and materials science research lab and not a field I was interested in — and the National Bureau of Standards Research Lab. But not the IBM Lab; for some reason it wasn’t on my radar. In those five places there were people spending their time advancing the frontiers of human knowledge. And a few years in graduate school convinced me that well, yeah, that’s only a peripheral activity in a university. But boy do you spend a lot of your time in committee meetings and writing grant applications and teaching survey courses that you’re not particularly interested in. Although it is a noble pursuit, as far as I’m concerned. TP: It is, but there’s nothing sadder to me than an academic who no longer is interested in their field, and is burned out from teaching those survey courses. So early on you had the sense that these corporate research places might be a better fit for you. TD: Of course the thing that I didn’t see, because I was so young, was that actually those institutions weren’t going to last forever. I was lucky to work at Bell Labs for twelve years and I was equally lucky to leave it just before that whole enterprise collapsed. TP: Certainly the way they thought of those institutions in the ’50s and ’60s was that they were of central importance to our new modern age. TD: But they’re not. And you wouldn’t see that when you were in your twenties, because you wouldn’t have enough experience. And now I see today, in the computing field, the great labs are Google and Facebook. TP: Where the money is. TD: Well in Google’s case where the people at the top are basically researchers that got lucky and found a way to fund what they were doing already in graduate school on a very large scale. I know a bunch of people that work at their lab; they’re working on interesting technical problems with the sort of real world applicability that you expect from an industrial lab. It’s a great place to do that sort of thing but will it still be there in twenty years? I don’t know. TP: It seems there is a kind of floating world of people that do that work. The successful companies change, but these big labs are always a component of Silicon Valley. TD: Some people ask me: How do I get a job in this business? Well, as far as I know what you do is you start doing it when it’s a really stupid idea. I have no advice for contemporary people on how to get into this business because you certainly don’t do it the way I did it. TP: You’re doing something obscure, it takes off, and then you’re in a totally different universe. Again I see a connection there between your professional life and your musical life. Resolutely, in the most positive possible way, you’ve kept your musical life amateur. TD: Yeah. I’m a big fan of amateurs. TD: Real professionals often lose sight of the real artistic goals. You think about professional orchestra musicians, for example. I know a couple, and they would hate for you to say it, but boy they think of themselves as music mechanics. Sit ’em down in front of a score, maybe they get to read it through once. There are the pieces they learned in school that they do every year and then there’s the new ones that they read once and then perform. There is a serious technical skill involved in doing that, but it’s pretty far removed from an intense personal involvement in art. Not all amateurs have the same attitude but the etymology of the word tells you: amateurs are people who do it because they love it. And ultimately everything is about love. I put on these concerts because there are sounds I love to hear. I often come up short trying to talk about the stuff because, if it’s right after a concert and I’ve just had my ears washed in amazing sound for two hours, how am I supposed to say something about that?